I meant to get this post written earlier, in commemoration of my husband’s birthday on October 3rd. But, we ended up having such a fun birthday weekend that I didn’t get a chance to write. So, here it is, one week late. Two years ago, my husband had a milestone birthday: 50. He wasn’t particularly excited about this big birthday. As his adoring and enthusiastic wife, I wanted to do something very special for him. The idea I came up with was giving him a “gift” and card each day, for 50 days. I dubbed it: 50 Days to Celebrate 50 Years! I planned it so his actual birthday was right in the middle – “Day 26”. We spent his birthday at Disneyland, which started our “Year of Disney”. Taking advantage of one child under 3 years old, Dennis, Sienna, and I got annual passes and we used them well. 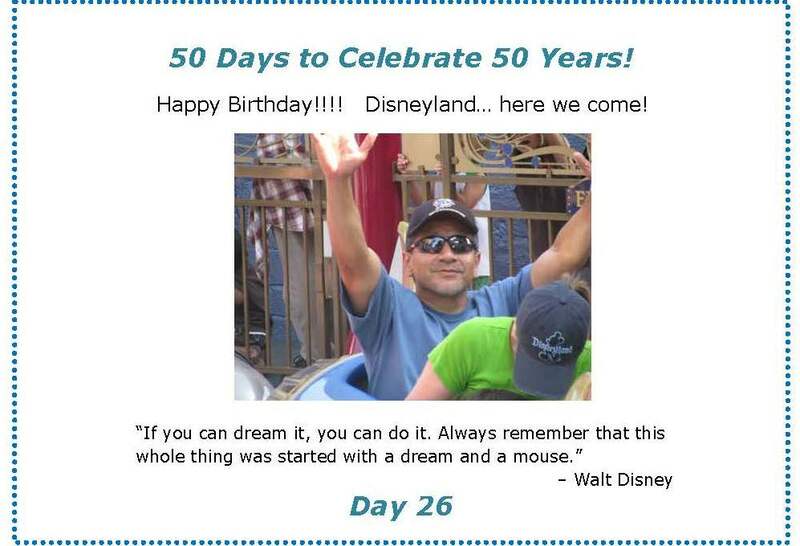 Our last trip to Disneyland included the days leading up to Dennis’s 51st birthday. Great, great memories! 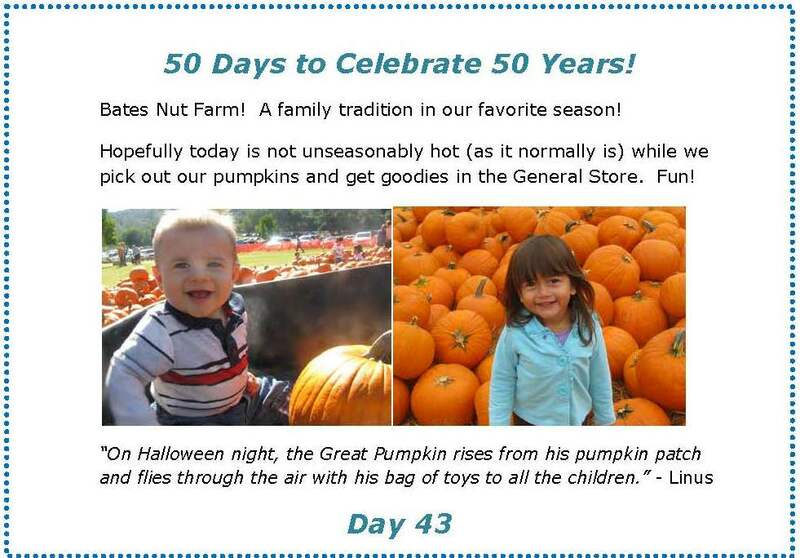 Back to the 50 Days, each “card” had the same format, including a photo and a quote related to whatever that days’ theme was. Some were tangible gifts – a USMC hat, cookies, a DVD collection on Ancient Egypt, etc. Others were just reminders about something special in his life: his days in Hawaii, favorite sports teams, his family, etc. 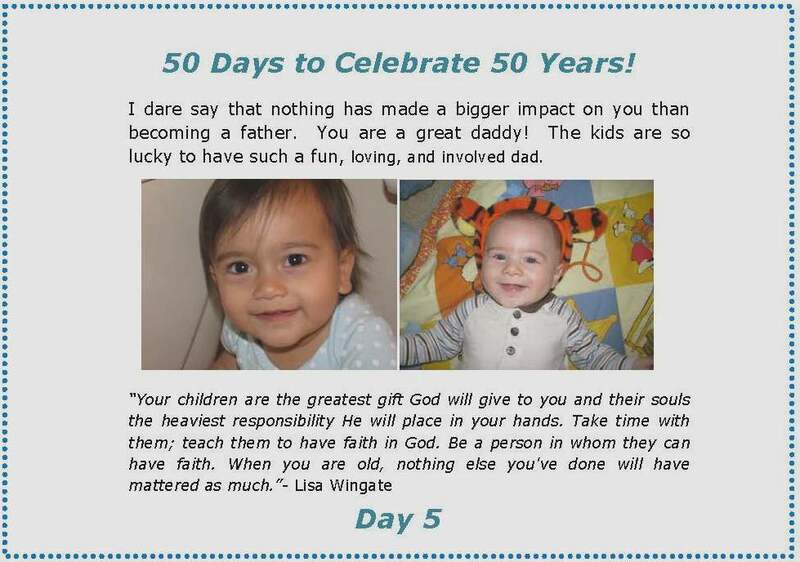 On Day 5, the quote was about parenthood: “Your children are the greatest gift God will give to you and their souls the heaviest responsibility He will place in your hands. Take time with them; teach them to have faith in God. Be a person in whom they can have faith. 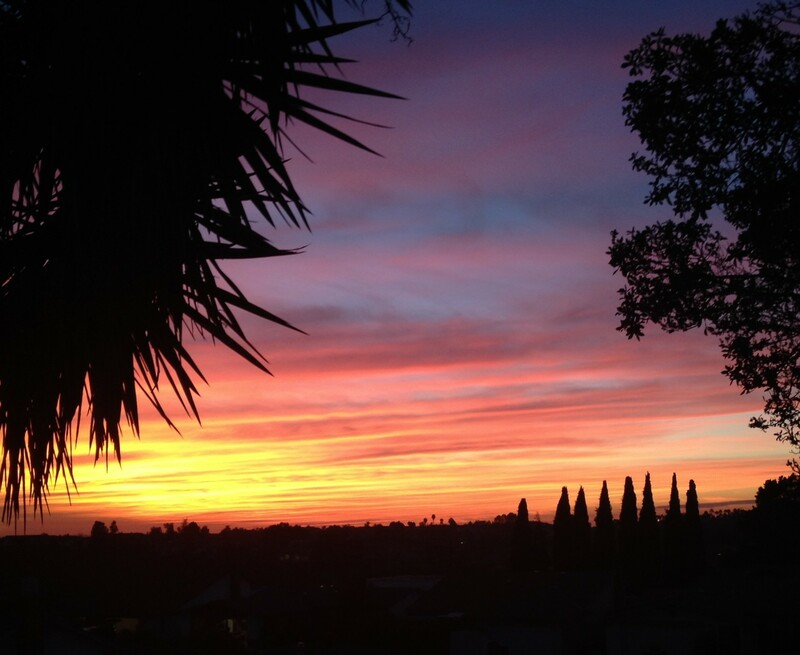 When you are old, nothing else you’ve done will have mattered as much.”- Lisa Wingate Along with this day, I did a special one separately for Sienna and Mateo. On those days I gave him parenting books as the gift. I’m so subtle. The quote for the Marine Corps day, commemorating Dennis’s service in the Corps, was: “A veteran is someone who, at one point, wrote a blank check made payable to ‘The United States of America’ for an amount ‘up to and including their life.”‘ – Lt. Col. George Goodson, USMC (Ret). I also incorporated a lot of sports themed days, since Dennis is such a huge fan. 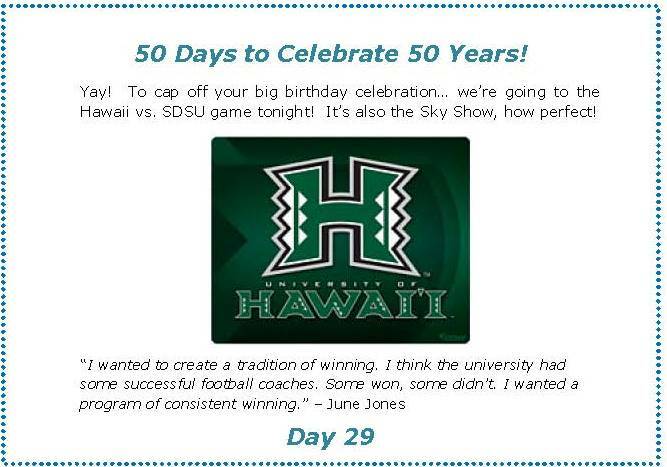 One gift was a book about baseball coaching and life lessons from Dennis’s favorite player, Cal Ripken, Jr. Then, I was so excited to discover that the University of Hawaii was playing San Diego State University in the Sky Show game, the weekend after Dennis’s birthday. I surprised him with tickets on the morning of the game, when we were heading back from Disneyland. The Sky Show is an annual event where they put on a huge fireworks display after the game, set to rock music by a local radio station. I felt a bit negligent holding my hands over Teo’s ears because it was WAY too loud for a toddler. 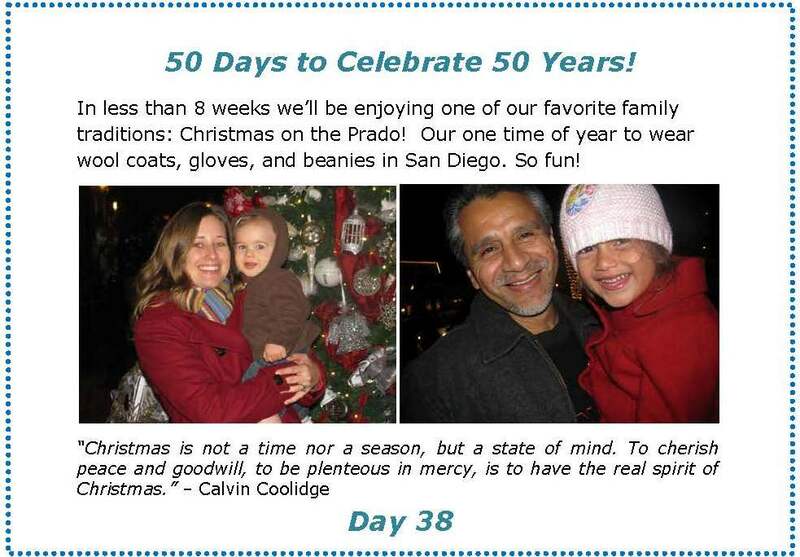 But, the memory of seeing Sienna and Mateo walking through Qualcomm Stadium in their footsie pajamas is very precious! Since Dennis has a sweet tooth (and an annoyingly high metabolism that allows him to indulge it! ), many of the gifts included treats of some kind. Lemon heads, Mentos, homemade cookies, pizza, beer, and Jolly Ranchers, among them. There had to be some inexpensive filler days, or this project would have broken us! Many of the themes were related to our favorite family traditions: Halloween, Bates Nut Farm for pumpkin picking, Christmas on the Prado. It was fun for both of us to remember all of the special traditions that we started and now get to share with our kids. After the 50 days were over, I had all of the “cards” printed and bound into a book, so we can look back on this special time.